This is a unique opportunity to focus directly on these methods while testing related meditations. Discussion and Q&A will help keep the day relevant and interactive. 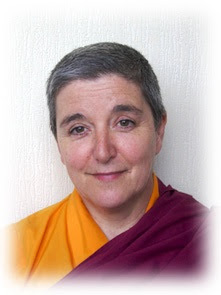 Venerable Mary Reavey is a Buddhist nun who teaches in Buddhist centres, schools, prisons and hospitals. Born in Dundee, Scotland, she was a Staff Nurse when she first encountered Buddhism. Currently she focusses on Shamatha meditation during a year long retreat as the Scottish West coast. She teaches Discovering Buddhism, and is an FPMT registered teacher.